Toric contact lenses are specially made contact lenses that correct for astigmatism. You may or may not be aware if you have astigmatism in your prescription. Astigmatism is very common and can range from very slight (-0.25 or -0.50) to very high (-4.00 or higher). Astigmatism is part of your prescription to correct your vision. It is usually when the cornea (the clear front portion of the eye) is shaped irregularly. A cornea without astigmatism has a round shape similar to a baseball; an astigmatic cornea is shaped more like a football or an egg. It causes light to hit the retina in more than one place, which means there are two focal points instead of one. This makes correcting vision a little more complicated. How Do You Know if You Need a Toric Lens? Also, if you have a high prescription with 0.75D of astigmatism, you may not need to correct that amount with contact lenses. Everyone is different, which is why it is highly recommended that you try out your toric contact lenses before you buy them, by asking for a free trial pair from your contact lens fitter. It should be included with the fitting fee that you pay. Toric lenses are made thicker and larger than spherical (non-toric) contacts in order to give them more stability on the eye. While a spherical lens can move around and rotate on the eye without affecting your vision, if a toric lens does this, your vision will blur. Most traditional contact lenses for astigmatism are made with a weight at the bottom of the lens so that gravity will keep the lens in the position it needs to be in to give you the best vision. There are newer lenses available that do not depend on gravity, but instead have varying edge thicknesses which stabilize then lens from eyelid contact. The thin part of the lens goes under the lids (top and bottom), while the thicker parts are at 3 and 9 o'clock on the contact lens, if you think of the lens as a clock face. This is more comfortable for some people, and it also prevents gravity from changing your vision while you are lying down watching TV! 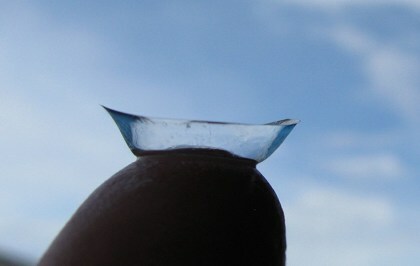 Many people wonder why there are lines on their contacts lenses. 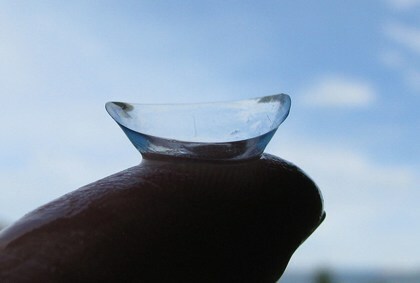 Most contact lenses for astigmatism do have small lines on them. 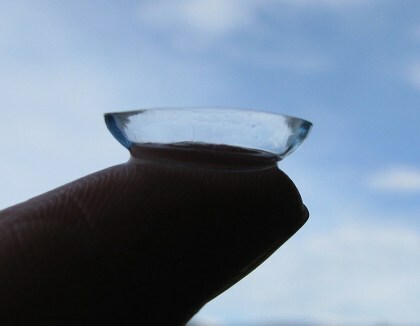 Some daily disposable lenses do not have the lines. What is the reason for the lines on toric contacts? These lines are an orientation marking and the purpose is to identify where the lens is sitting on the eye. For the practitioner, when checking the fit of the lens, the small line on the contact lens should be sitting at the bottom of the eye by the lower lid. If you imagine the lens as a clock, the small line should be sitting at 6 o'clock. There are several designs, typical of different brands. For example, Acuvue Oasys for Astigmatism lenses have two lines, one at the top and one at the bottom of the lens. Air Optix for Astigmatism has three lines, one each at 3, 6, and 9 o'clock. For the contact lens wearer, the lines can give an indication as to which is the top and bottom of the lens when inserting, though it really doesn't matter since the lens will rotate to the correct position anyway. Because contact lenses for astigmatism are shaped differently than spherical (non-toric) contact lenses, you have to handle them a little differently. Weighted toric contacts are a little fussier to insert because of the weight. 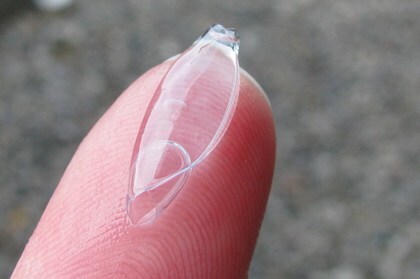 Some people get a little more frustrated because the lens falls of the finger more easily because of the weighted edge. One way around this is to bring the lens upwards toward the eye instead of horizonally. While they may be a little harder to insert, they are easier to tell if they are inside out. The differing thicknesses make it much more obvious. With the Acuvue Oasys for Astigmatism, one difficulty some people have is that they have a tendency to roll up. While experienced wearers may find this only a slight inconvenience, new wearers often find this another source of frustration.